The real estate market is a place where most people will make their largest investment ever. It is a place where fortunes can be, and often are, made. It is not a place, however, for you to “wing it”. While the myriad TV shows about real estate make the process look so simple – it’s not really that simple… they make it seem like all you need to do is slap a for sale by owner sign in the yard, have one open house with fresh flowers and fresh baked cookies and bam! SOLD! in one day. Well I can tell you that in New Hanover County, North Carolina it takes an average of 121 days to sell a home. An average means that some houses take much longer to sell and some much less than 121 days to sell. 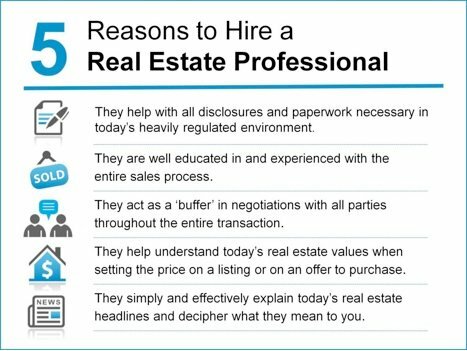 You need a professional, full time, well educated, ethical and trustworthy REALTOR to represent you whether buying or selling real estate. Currently in North Carolina there are over 24 pages of contracts involved with buying or selling most homes. The state law requires much of this paperwork regardless or whether or not you hire a REALTOR. REALTORS are trained and educated on the contracts, which are constantly changing, so they can advise you during the process. They can also refer you to a real estate attorney to represent you on all legal matters involved in the process. There are about 180 typical actions, research steps, procedures, processes and review stages in a successful residential real estate transaction that are normally provided by full service real estate brokerages in return for their sales commission. (Based on a report prepared by the Orlando Regional REALTORS Association). So this means that if you choose to go it on your own, you are going to have to do all 180 things yourself… or they don’t get done… which probably means your transaction doesn’t end in a successful purchase/sale. While there will always be that one guy (or gal) who thinks he (she) is the all-time greatest negotiator, the vast majority of folks do not like confrontational interactions. A negotiation for the purchase/sale of an asset as large as a piece of real estate can be a very confrontational interaction. The role of the REALTOR is to act as a buffer between the two parties who are in the midst of a very emotional and high-level financial transaction, both wanting to get the best they can get often at the detriment of the other party. A real estate professional is experienced in all aspects of the negotiation and is bound legally to do only what is in the best interest of his/her client. Perhaps the single most important aspect of the transaction is the value of the piece of property. If you are a seller you want to know how much you can expect to get for the sales price and how much of that you will walk away with in your pocket. You want to advertise the property for sale at the right price so you sell for as much as possible but you don’t want to price it so high that no buyers make you an offer (and YES if you price it too high MOST buyers will not want to offend you by making a low offer…thus you don’t get any offers). If you are the buyer, you want to know how much to offer. Now multiple offer situations are happening more frequently and if a buyer offers too low, they can either be rejected completely by the seller or they can cause the negotiation to take too long thus allowing time for a competing bid to come in… allowing the seller to be in the driver’s seat. Any good professional, whether a real estate professional, doctor, lawyer, CPA, etc., will have the heart of a teacher. Real estate brokerage is a service business. The professional REALTOR is there to educate you about the conditions impacting today’s real estate market. It is as easy as picking up the newspaper or searching the Internet for real estate news to see conflicting headline after conflicting headline. “Prices are up 20%”, “Among worst markets in nation”, “Best year since the crash”…well which is it? All real estate is local and your real estate professional will know the local market conditions and will lead you through the process, like any good teacher would, making sure you understand all that is going on around you. 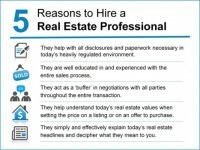 A real estate professional is a crucial member of your team when buying or selling real estate. You could be buying your first home or your tenth home, an investment property or a vacation home, commercial or residential…whichever it is you are best served in the care of a full time, well educated, ethical, trustworthy real estate professional. I really love how you expanded on these basic bullet points. I think it would be wise for all of us to take the time to understand what this looks like in our individual markets and make sure the public knows how hard full-service agents work for our money. I generally agree with four of the five points that the author has highlighted, however, It is my educated opinion that he has overstated the negotiating skills of most real estate agents. I came into real estate from a background of high stakes negotiating so I have been a keen observer of how real estate agents employ the craft. In my opinion, a good negotiator is the exception, certainly NOT the rule. There are companies that offer negotiating courses designed to provide a “professional designation”, and while they are able to lay a decent foundation of understanding the process, the only way to really become an expert negotiator is to be negotiating on a continual basis. A very small percentage of real estate agents get ANY formal training in negotiations. The average real estate agent is lucky to do one transaction per month, and they usually “need” that transaction to close in order to put food on their own table. When a negotiator has something to lose by not coming to agreement, they lose objectivity, and become too emotionally involved in the transaction to be a tough negotiator. Most people think that coming to an agreement that is “fair” to all parties is the goal of a good negotiator. But a top notch negotiator will work to get every possible concession from the other side of the transaction without it falling apart. Most real estate agents (or people in general) don’t know a gambit from shinola. This is an area of great opportunity for the agent who will study and learn how to be a great negotiator. Results are rather easy to quantify and then highlight in testimonials, which can earn you many more listings and Buyer/Boker agreements. Everyone wants a really good negotiator working on their behalf. So become one! Good, concise, and to the point information. Thank you! I am glad to know that a realtor is there to act as a buffer between the two parties who are in a very emotional and high level financial transaction. Having the help of someone with such developed negotiation skills would totally be ideal. I have also heard that it is wise to find a realtor with great staging skills to ensure your house looks exquisite at each showing. Wow, I sure didn’t know that there are about 180 steps and procedures that I need to go through in a real estate purchase! My wife and I are currently considering getting a place for ourselves. With our current schedules, it certainly looks like we won’t have enough time to sort out that much paperwork by ourselves! We’ll be sure to go look for reputable real-estate agents that can help us out should we decide to go through with a property purchase. It got me when you said that hiring a professional will assure us that the transaction will most likely end successfully. I guess I have to suggest this to a friend of mine because they have been waiting to have the house of their grandparents sold. However, it hasn’t been so for three years after posting it online. Maybe, it might be due to the way it was being handled since they don’t hire professionals. I really like how you said that a good real estate broker will help you understand the conditions affecting the real estate market and help guide you through the buying process. My niece and her husband are looking to buy their first home together, but they’re not sure how to get a home that fits their budget and their needs, or how to ensure that they find the best location. I’m sure they’d really benefit from working with an experienced real estate broker that has the genuine desire to help guide them through the process so they get the help and information they need to make the right decision. Thanks for the helpful information. I think that I’m decent at negotiating yet when it comes to homes, I would for sure have to hire someone to do it for me as I don’t know a whole lot about them. Going off what you said, it would be a good idea to hire a professional since they would know a lot more than the average person. When it comes time to sell my home, I’ll for sure seek out the advice on that matter.